Many people notice signs of aging when skin begins to sag around the face and neck. Laser skin tightening is appropriate for men and women of all skin types and skin tones who wish to achieve dramatic results without painful surgery and lengthy recovery times. The most successful laser skin tightening candidates experience permanent results as the collagen under their skin is regenerated, producing a more youthful complexion. Laser skin tightening helps patients achieve younger-looking, smoother skin without undergoing expensive surgeries such as a face lift or a tummy tuck – and the results won’t fade after a few months. Laser skin tightening treatment cost varies depending on the individual patient’s needs such as the size and location of the area to be tightened, and the type of laser used. However, facial skin tightening is considerably less expensive than invasive surgeries, and financing options are available. Using the latest technologies, laser skin tightening effectively rejuvenates all skin types for firmer, more youthful-looking skin. Popular skin tightening treatments utilize the Titan® or Polaris™ systems, which use laser technology to gently heat deeper layers of collagen while cooling the skin’s outer layers. Skin tightening patients enjoy immediate results with minimal discomfort. A cosmetic dermatologist can determine the most effective laser skin tightening treatment for you. One of the greatest benefits of laser skin tightening is the minimal amount of risk associated with the procedure. Patients experience firmer skin with fewer fine lines and wrinkles, and there is no downtime. 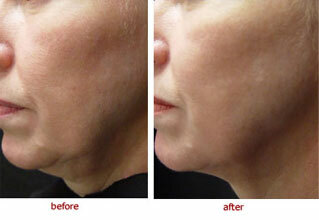 Skin tightening occurs immediately, and results continue to improve over the next several weeks. Risks associated with laser skin tightening include temporary reddening of the skin, a slight chance of scarring, and the possibility of brief lightening or darkening of the skin in treated areas.